Have you ever passed up on a color for months, and then when you finally decide to buy it you realize how silly you were for passing it up so many times? This is how I feel about the Milani 3D holographic colors. I passed up on these for ages. I didn't find them very interesting in the bottle. I was very wrong these are great! This is a lavender holographic glitter polish. This isn't a glitter as in the sense like mixed in glitter. I can't really describe it. It's not like China Glaze OMG collection holos, but like the Kaleidoscope collection holos. You can really see the hololgraphic action in this polish on the nails. I didn't really see this in the bottle, but it really surprised me on the nails. Fantastic color!! Silly me for not getting it sooner! What is a polish you held back on buying, but wish you hadn't? Where did you find these? I need more holos like STAT haha. I held off on "Yodel me on my cell" from the OPI Swiss Collection for the longest time... So glad I bought it though. It's one of m faves now. I picked up the yellow-green one and it's great! It was my first holo polish. I was a little disappointed in the purple one because it wasn't quite as holo as I wanted it to be. However, it's still a great color! lol i've still passed on them. i'm not sure i like them.. :-) i want more shine/glitter/ or something.. i don't know. I've been passing on these since they came out, then I'll get ready to place an order for them on CherryCulture and always end up talking myself out of it for some reason! I love this line from Milani I am glad you decided to try it!! 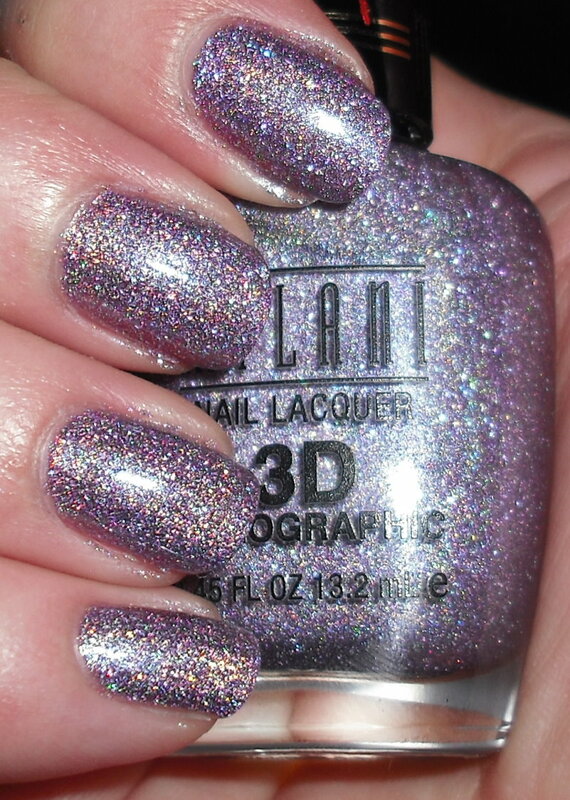 Aaaaah, this is what I call holographic, a very beautiful polish indeed! I keep seeing these when I go to fill my prescriptions at the drugstore and I keep passing them up.. maybe I'll pick one up now, they do look pretty tempting. OPI Glamor. I still weep on passing that one up when I had the chance. Let them have Polish- I see these at CVS,Walgreens, Target, and some grocery stores. They are pretty easy to find. Megan- I didn't get the yellow-green one those don't tend to work on my skin. However, I've seen pictures of it and I'm thinking about getting it anyways! Pretty- I know what you mean. They just don't look that great, but they are so much better on the nail. Jess- LOL, been there. I know! In the bottles they don't look that great, but they really are! Lolaa- It's definitely holographic! It's not shy! attackeddastoria- Definitely give one a try. I think they're worth it. Jana- I've seen some frankens with these they always look great. Anita- Oh geez that's a GORGEOUS polish..I take it you can't find it anymore? I passed up my fave polish a few times before I bought it but now I can't believe I ever didn't have it in my collection.